Star Trek: Enterprise is the last in the long line of Star Trek TV programs and movies officially produced and licensed by what is now CBS Paramount Television before J.J. Abrams and company created an alternate Star Trek timeline so that they would not be locked into the established continuity of Star Trek and yet borrow and reference whatever they chose from Star Trek's rich mythology. The third season of Star Trek: Enterprise was different from the first two seasons in many ways. For starters the restored Star Trek title was put back into the the series. The first two seasons were originally broadcast simply as Enterprise. Even the series opening song "Faith Of The Heart" was sped up a bit to reflect the urgency of the series new tone while keeping the mix of archival footage and Star Trek produced scenes to give the viewer a sense of the timeline from our early twenty first century present to the mid twenty second century setting of the show, approximately 150 years into the future when the episodes first aired and one hundred years before the time of Kirk and Spock as an approximate end point for the series. The first two seasons of Star Trek: Enterprise suffered from too much referencing things other Star Trek shows had already explored or dramatized with little to no dramatic effect on the overall storyline. However with the third season of Star Trek: Enterprise, what had been developed that worked from the first two seasons gave the third season the backbone to create a season long story arc set up from the second season finale. In the second season's chilling finale, a mysterious and deadly race of aliens called the Xindi sprang from the far reaches of the galaxy and attacked Earth, massacring millions of people. With another more catastrophic attack looming, Archer and the Enterprise crew are forced to undertake a life or death mission into the Delphic Expanse, a perilous and frightening place where even the known laws of physics do not apply, to seek out the Xindi and save the Earth. After some bartering with the local administrator of the mining facility, The Captain and Trip are finally introduced to their first live Xindi, who looks far more human than the corpse recovered on Earth after the first attack. When they attempt to leave with the Xindi back to the shuttle pod, they discover it is a trap. Warships are heading toward the Enterprise with the intention of disabling the ship and taking the crew back down to the planet to work as slave labor. Meanwhile a council of the various Xindi species is already aware that the Enterprise has entered the Delphic Expanse and has sent out a scout to deter their mission. So from here are the seeds of action, loss, love, desperation, hope, tragedy, and eventual help and cooperation are planted that grow far beyond this storyline and in fact impact the series' fourth and final season, which no one can deny was Star Trek: Enterprise' best and thus the show can be looked back fondly as truly ending when it was in it's prime, something few television series can claim credit for doing regardless of the reasons. Off all of the releases of Star Trek on Blu-ray Disc, Star Trek: Enterprise was the only shot shot natively in 16 by 8 as opposed to (1.33:1) and broadcast in high definition, making it practically tailored made to be viewed on Blu-ray Disc and the results are clearly apparent with it's beautiful 1080p/24fps high definition (1.78:1) widescreen presentation that looks superior to both the original high def television broadcasts and viewing the standard definition DVD discs up converted to 1080p/60hz on an upscaling DVD player or Blu-ray Disc player. I realize purists will not like this, but I love watching Star Trek in high definition widescreen so much that I wish the option was available on the other shows even if it means some shots might have to be digitally altered to accommodate the matting of the image because on the high def extras found on other Trek television Blu-rays, widescreen clips of scenes from the classic shows are often presented in 1080p and they look great. A new theatrical English DTS-HD MA 5..1 Surround Soundtrack is provided for all twenty two season three episodes spread across six Blu-ray Discs within the Elite Blue BD case and there is a German Dubbed 5.1 Surround Soundtrack as well as French and Japanese Language Dubbed Stereo Surround Soundtracks encoded for each episode along with English Subtitles for the Deaf and Hearing Impaired and German, French, Dutch and Japanese Language Subtitles encoded as options. There are also a lot of new high definition and archival extra value features carried over from the original DVD sets in standard definition. More than I can possibly expound upon completely, but I can touch upon the bulk of the new stuff and note the old. On disc one for the episode "The Xindi," the text commentary by Mike and Denise Okuda is provided and two short mission logs from the DVD releases covering "The Xindi Saga" beginning and Enterprise Moments from season three are also provided. Disc two features a brand new audio commentary by David Livingston and David A. Goodman on "Impulse" along with an archival text commentary by Mike and Denise Okuda for the episode too. Another audio commentary by Mike Sussman and Tim Gaskill recorded in 2008 for "Twilight" has been carried over from the previous DVD release. Disc three includes both a new audio commentary by David A. Goodman and Chris Black on "North Star" as well as an earlier recorded audio commentary for the same episode with Mike DeMeritt. Writer Manny Coto recorded two audio commentaries for the episode "Similitude." The new one is shared with Actor Connor Trinneer while the previous one was a solo commentary with Coto. Deleted scenes for that episode and "Chosen Realm" from the DVD release wrap up the bonus features on disc three. The final disc has the most extra value content, including all of the newly created video material for this Blu-ray Disc release. A brand new audio commentary by Chris Black and Andre' Bormanis is provided for the third season's penultimate episode, "Countdown" as well as an archival text commentary by Mike and Denise Okuda. Then there are four interesting brand new retrospective documentaries included on the final disc. The first three are really parts of a larger feature length documentary although the parts can only be viewed individually. Under the heading "A Time Of War" are part one, "Call To Arms" (28:07), which features brand new interviews with Scott Bakula, Branon Braga, Rick Bernan, and Seth MacDonald. 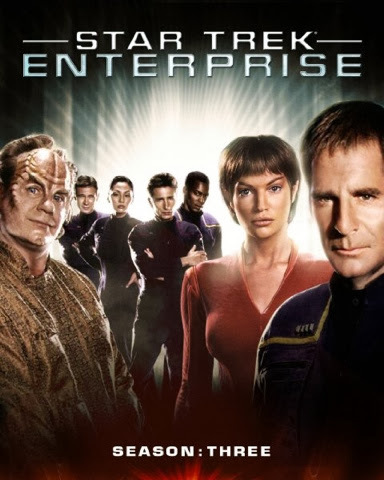 This gives more of the point of view of the producers and creative crew as well as the lead Star's perspectives on the direction the show had gone down from the first two seasons and the necessary changes made to develop Star Trek: Enterprise into the show it evolved into by the fourth season. Basically the consensus is that season three was where Star Trek: Enterprise found it's unique voice. The second part entitled "Front Lines" (29:51) gives the cast perspective with interviews that include a frank Jolene Blalock, who basically seems rather subdued and just goes out of the way to tell viewers not to go school just for modeling and acting since the likelihood of success is so slim. I can applaud her for being honest about her feelings. She reveals that she was just twenty two years old when she appeared on Star Trek: Enterprise and I think she means to tell young people that what happened to her and to be able to work in two tough careers steadily doesn't happen often. Other cast members who participate in the documentary include Conner Trinneer, John Billingsley, Linda Park, Dominick Keating, and Anthony Montgomery. One insight from a cast member was if the show went from the pilot to season three and then the fourth season was the second, the series would have exceeded what fans wanted and had the potential to be the most innovative Star Trek yet since they would have future seasons open to explore beyond what viewers expected. The third part "Final Conflict" (28:36) continues with more cast and crew interviews, including Manny Coto, and brings the entire triple feature to a truly comprehensive and retrospective summary of Star Trek: Enterprise' third season. An additional featurette entitled "Temporal Cold War: Declassified" (20:17) brings the entire multi season story arc into focus from the first season through the early part of season four with interviews with recurring cast members that include Matt Wilson, John Fleck and Scott MacDonald. Archival footage carried over from the DVD extra features that include a profile on Conner Trinneer, Director Roxann Dawson, behind-the-camera with Marvin Rush, Enterprise Secrets, Outtakes, a Photo Gallery and three NX-01 Files wrap up the bonus features included within this set. The interactive seamless menus are well rendered and easy to navigate. Star Trek: Enterprise Season Three is the definitive home video presentation of the TV series on Blu-ray Disc and is a must add to any sci-fi and Star Trek fan's home video collection. It is available now as of January 7, 2014 at retailers on and offline courtesy of CBS Paramount Home Entertainment.